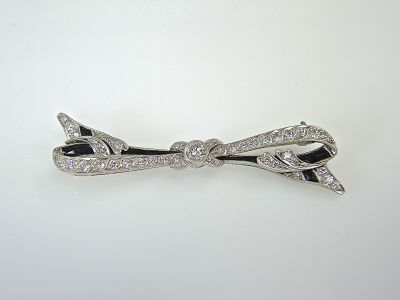 One custom-made platinum and onyx bow brooch. One old European cut diamond (0.25 carats: VS2 clarity: G-H colour). Forty-six old European cut diamonds (1.88 carats: VS clarity: G-H colour). Ten tapered baguette onyx pieces.